The wet plate collodion process was a manner of taking photographs which used panes of glass, coated with a chemical solution, as the negative. It was the method of photography in use at the time of the Civil War, and it was a fairly complicated procedure. The wet plate method was invented by Frederick Scott Archer, an amateur photographer in Britain, in 1851. Frustrated by the difficult photography technology of the time, a method known as calotype, Scott Archer sought to develop a simplified process for preparing a photographic negative. His discovery was the wet plate method, which was generally known as the “collodion process.” The word collodion refers to the syrupy chemical mixture which was used to coat the glass plate. A glass sheet was coated with chemicals, known as collodion. The coated plate was immersed in a bath of silver nitrate, which made it sensitive to light. The wet glass, which would be the negative used in the camera, was then placed in a light-proof box. The negative, in its special light-proof holder, would be placed inside the camera. A panel in the light-proof holder, known as the "dark slide," along with the lens cap of the camera, would be removed for several seconds, thereby taking the photograph. The “dark slide” of the light-proof box was replaced, sealing the negative up in darkness again. The negative could be coated with a varnish to ensure the permanence of the image. Prints would later be generated from the glass negative. The steps involved in the wet plate process, and the considerable skill required, imposed obvious limitations. Photographs taken with the wet plate process, from the 1850s through the late 1800s, were almost always taken by professional photographers in a studio setting. Even photographs taken in the field during the Civil War, or later during expeditions to the West, required the photographer to travel with a wagon full of equipment. Perhaps the first war photographer was a British artist, Roger Fenton, who managed to transport cumbersome photographic equipment to the battlefront of the Crimean War. Fenton had mastered the wet plate method of photography soon after it became available and put it into practice shooting landscapes of the British midlands. Fenton took a trip to Russia in 1852 and took photographs. His travels proved that the latest photographic method could be utilized outside of a studio. However, traveling with the equipment and the necessary chemicals to develop the images would present a formidable challenge. Traveling to the Crimean War with his photographic wagon was difficult, yet Fenton managed to shoot impressive photographs. His images, while praised by art critics upon his return to England, were a commercial failure. While Fenton had transported his ungainly equipment to the front, he purposely avoided photographing the ravages of war. He would have had many opportunities to depict wounded or dead soldiers. But he probably assumed his intended audience in Britain did not want to see such things. He sought to portray a more glorious side of the conflict, and tended to photograph officers in their dress uniforms. In fairness to Fenton, the wet plate process made it impossible to photograph action on the battlefield. The process allowed for a shorter exposure time than previous photographic methods, yet it still required the shutter to be open for several seconds. For that reason there could not be any action photography with wet plate photography, as any action would blur. There are no combat photographs from the Civil War, as people in the photographs had to hold a pose for the length of the exposure. And for photographers working in battlefield or camp conditions, there were great obstacles. It was difficult to travel with the chemicals required for preparing and developing the negatives. And the glass panes used as negatives were fragile and carrying them in horse-drawn wagons presented a whole set of difficulties. 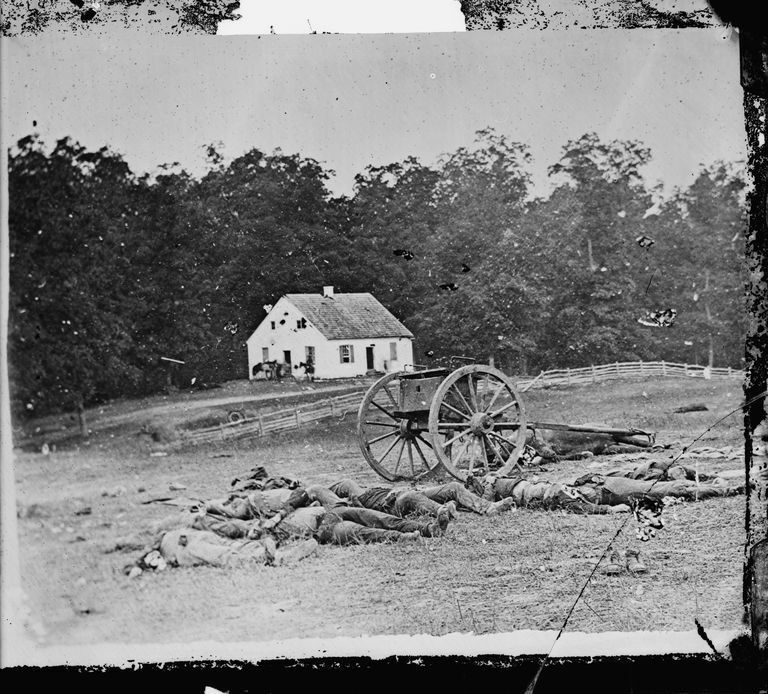 Generally speaking, a photographer working in the field, such as Alexander Gardner when he shot the carnage at Antietam, would have an assistant along who mixed the chemicals. While the assistant was in the wagon preparing the glass plate, the photographer could set up the camera on its heavy tripod and compose the shot. Even with an assistant helping, each photograph taken during the Civil War would have required about ten minutes of preparation and developing. And once a photograph was taken and the negative was fixed, there was always a problem of a negative cracking. A famous photograph of Abraham Lincoln by Alexander Gardner shows damage from a crack in the glass negative, and other photographs of the same period show similar flaws. By the 1880s a dry negative method began to be available to photographers. Those negatives could be purchased ready to be used, and did not require the complicated process of preparing the collodion as required in the wet plate process.